An optical attenuator is used to reduce the power level of a laser signal propagated in an optical fiber. (VOA) Variable optical attenuator is employed in a fiber optic system to regulate power to desired levels and to protect receiving units from damage caused by irregular power levels. The VOA is adjustable from 0dB to 40dB. 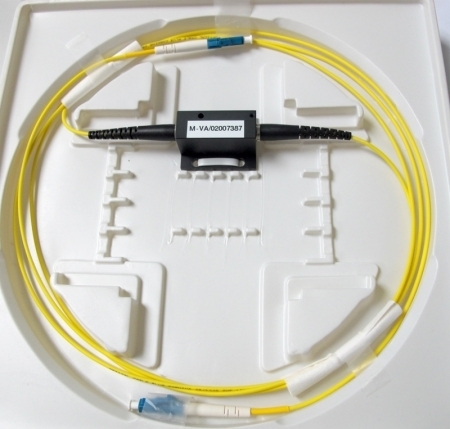 Units have SMF28e fiber, a 3mil jacket and are terminated to customer specifications. Connectors offered are SCUPC, FCUPC, LCUPC, STUPC. SCAPC, FCAPC and LCAPC. The VOA is also available in multimode.